Rafael Nadal of Spain speaks to members of the media after withdrawing from his men’s singles semifinal match against Roger Federer of Switzerland due to a right knee injury on Day 13 of the BNP Paribas Open at the Indian Wells Tennis Garden on Saturday. INDIAN WELLS, Saturday - The 39th match between Roger Federer and Rafael Nadal failed to materialize on Saturday as the world No. 2 Spaniard hobbled out of Indian Wells to send Federer into a title clash with Dominic Thiem. 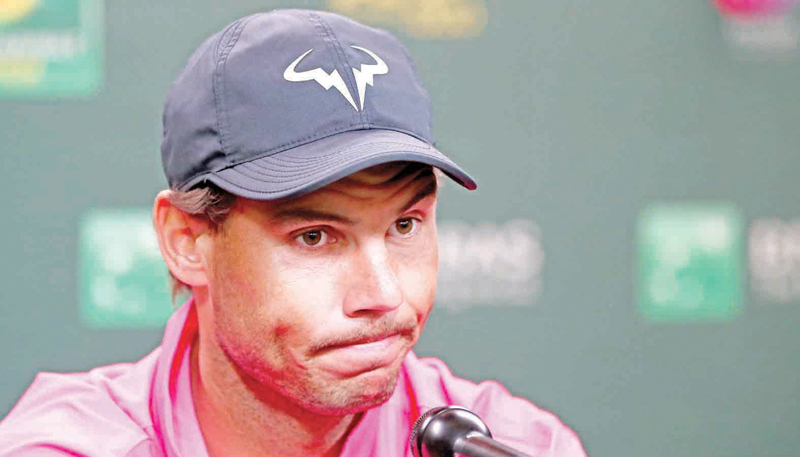 Nadal, whose longstanding right knee trouble flared up in his quarter-final victory over Karen Khachanov, couldn’t take the court for the blockbuster semi-final with Swiss great Federer. Federer, seeded fourth as he pursues a record sixth title in the California desert, will battle 25-year-old Austrian Thiem, who is seeking his first title in one of the ATP’s prestigious Masters 1000 events.